Today we’ll be introducing the last two of No, Thank You!! !‘s four pursuable leads: Maki and Kouichi Inui. 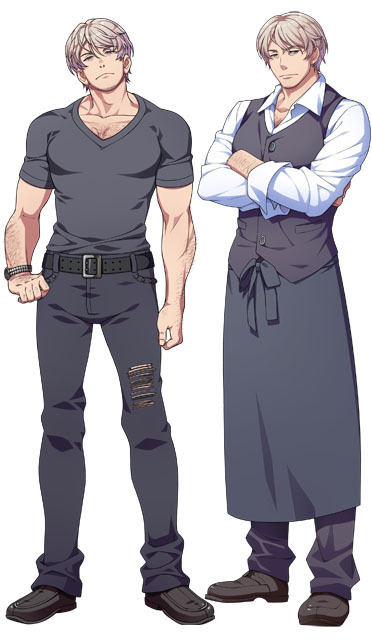 Maki is sótano’s manager (in name only, Ryu does most of the actual work) and head chef. He doesn’t speak much or emote much and no one knows a whole lot about him. Maki’s not even entirely sure how old he is. I guess you could say he’s the quiet mysterious type taken to an extreme. Maki’s an extremely talented chef and bartender, but he’s also apathetic to an almost comical degree. Maki doesn’t like wasting energy on things that he finds annoying, like speaking for example (a whopping 40% of his lines are “……” with some kind of grunt or sigh for the voicing!). Instead of arguing or complaining, Maki opts to put the bare minimum effort in if he’s forced to do something, or he’ll just ignore or endure the annoyance. Oddly, Maki’s the only one of the main four who just rubs Haru the wrong way right off the bat. Haru doesn’t really even understand it himself, but something about Maki just pisses him off. But Haru’s not about to let that get him down! A challenge can be interesting too after all. 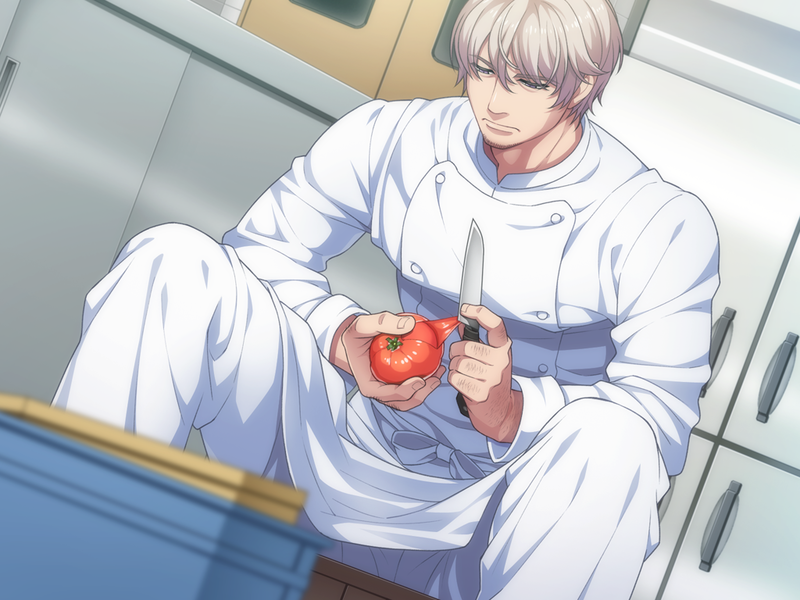 Maki’s route is a little different from the others in that it’s actually quite action heavy. The last couple chapters really make your heart pound (in more ways than one!). And despite Maki’s characteristic deadpan blank stare, it’s actually quite an emotional route. The last of the pursuable leads in No, Thank You!!! is sótano’s owner, Kouichi. Kouichi is a kind, middle-aged man who has a propensity to sort of collect oddballs in his attempts to help people out. As much as he tries to be practical about things, he really hates seeing people in trouble, especially if he can do something to help them out. He lives alone in a small apartment littered with empty beer cans and sake bottles. He knows that, at his age, he should probably try to eat better, but he’s got a taste for comfort foods and booze. That said, he’s still in pretty good physical condition and can definitely hold his own in a fight. Route-wise, it’s generally recommended that you play Kouichi’s route second or third. It’s a pretty heavy route and it’s just not the best route to end on. It’s not like going off the suggested order will ruin anything, of course. 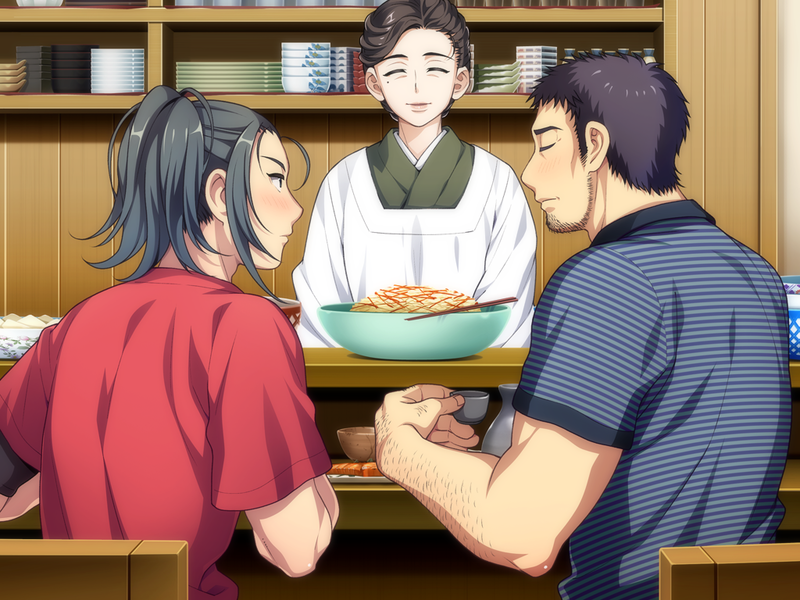 I know Kouichi (and Maki too for that matter) is pretty far off the usual BL character types, but you’d really be doing yourself a disservice if you skipped out on his route (or any of them really). All the guys are great in different ways and you really don’t get the full picture of who Haru is without them all––so, seriously, even if they’re not normally the type you go for, you should really give them a chance!